Details of Battle Field of Plassey, Palashi, Nadia – how to go to Battle Field of Plassey, Palashi, Nadia, best time to visit Battle Field of Plassey Palashi, Nadia when to go, where to stay at Battle Field of Plassey, Palashi, Nadia, Hotels lodges guest houses near Battle Field of Plassey, Palashi, Nadia, time of Battle ground of Plassey, Palashi, Nadia, places to visit near Battle Ground of Plassey, Palashi, Nadia sightseeing tourist spots. All details about Battle Field of Plassey, Palashi Monument, Nadia. Plassey (Palashi) is situated on the banks of Bhagirathi River approximately 150 Kms from Kolkata. 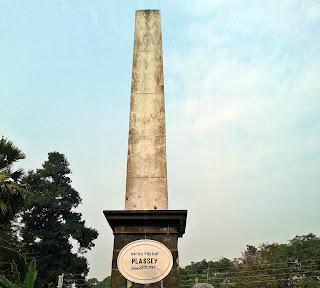 Plassey is a very famous name to all of us and has historical significance too. Whenever we heard of Nawab Siraj-ud-Daulla, the name 'Plassey' automatically comes in our mind because of historical battle fought at Plassey village way back in 1757. Let’s check out details about Battle Ground of Plassey (Nadia, West Bengal) where Nawab Shiraj ud Daulah fought an important battle against British. Are you looking for Why Plassey is so famous in West Bengal & India and are you in search of Where is in West Bengal & How to go to Plassey Battle Field from Kolkata; all possible details regarding Battle field of Plassey (Palashi, Nadia) including How to go, Where to stay, What to see, When to visit & other details as follow. • Significance of Battle Field of Plassey, Palashi, Nadia: - Let’s check out why Battle Field of Plassey of Palashi, Nadia is famous (popular) and attracts tourists. If we are not aware of Nawab Siraj ud Daulla and if also not aware of how East India Company first stepped in Bengal, then questions like 'Why Plassey is famous in History', 'What happened at Plassey', 'What is Plassey Battle Field', 'Where Nawab Siraj ud Daulah battles against British in Bengal', 'What is the historical significance of Plassey Battle Ground' etc etc. Let's check out what the historical value hidden at Plassey (Palashi) village which lies around 150kms from Kolkata. Plassey (Palashi), a small unknown village on the banks of Bhagirathi River (Ganga River) in Nadia district & very close to Murshidabad district of West Bengal, came under focus on 23rd June 1757. Way back in 1757 on 23rd June the Last Nawab of Bengal Nawab Siraj Ud Daulah & his French supported troops fought against British East India Company under the leadership of Robert Clive. The Battle of Plassey (Polashir Juddho / Palashi Yuddho / Palashi ka Jung) made the way of British rule in Bengal; since Robert Clive (British East India Company) defeated the last Nawab of Bengal Siraj ud Daulla. • Battle Field of Plassey, Palashi, Nadia Opening & Closing Timings: - A Statue of Nawab Siraj ud Daula & a Monument are there now on Battle Ground of Plassey. Thus, no entry ticket or entry timings are there. Whenever you want you can go & visit this Historical Place of Bengal. • Best time to visit Battle Field of Plassey, Palashi, Nadia: - Actually, there is nothing to see at Battle Ground of Plassey; except a Statue of Nawab Siraj-ud-Daulah and a Monument. Thus, any time of the year (except monsoon / rainy season) whenever you have time; you can go & visit Plassey Battle Ground situated in Nadia district of West Bengal. • Nearby places to visit from Battle Field of Plassey, Palashi, Nadia: - What to see at Plassey Battle Ground? Except the historical significance of this place, there is nothing to explore or see in Plassey (Nadia). A golden colored Nawab Siraj Ud Daula statue & a Battle Field of Plassey Monument are there at Plassey Battle Ground. But, there are lots of tourist places situated near by Plassey (Palashi) in both Nadia & Murshidabad district of West Bengal. If you are planning to visit Plassey Battle Field of Nadia then please keep in mind about following places to visit - Ranaghat Church (Nadia), Krishnanagar Rajbari (Nadia), ISKCON Temple Mayapur (Nadia), Bethuadahari Wildlife Sanctuary (Nadia), Plassey Battle Field, Murshidabad [Hazarduari, Imambara, Kathgola Bagan Bari, Katra Masjid, Azim un Nisha Tomb, Jafarganj Cemetery, Khosh Bag, Motijheel, Jahan Kosha Cannon etc. in Murshidabad]. Road Route to Plassey Battle Field: - Those who are planing to visit Plassey Battle Field by Road in Car from Kolkata; are suggested to take National Highway 34 [NH 34] from Barasat (North Kolkata) and drive for 140kms on NH-34 Road. Plassey is only 50kms from Krishnanagar on NH 34 Road. After reaching Palasi area ask local people for 'Plassey Monument' [because, some people may not know about Battle Field]. You required taking another 10kms road leaving NH-34 in Palashi. Regular Bus from Kolkata to Murshidabad , Bus from Kolkata Siliguri runs and goes over Palasi more as well. Train route to Plassey: - Plassey / Palasi railway station is there and you required taking auto / van / local transport to reach Plassey Battle Ground. It's not recommended. • Accommodations near Battle Field of Plassey, Palashi, Nadia: - Now, let’s check out hotels, lodges, or any kind of rooms on rent are available or not near to Battle Field of Plassey. Since, there is nothing to see except a Golden Statue of Nawab Siraj-ud-Daula and Monument, thus visiting Plassey Battle Ground takes maximum of 15 minutes. This is why, NO HOTELS & LODGES there to stay at or near Plassey Battle Field (Nadia, West Bengal). It’s recommended to have a visit of Plassey Battle Field while going to Murshidabad Tour from Kolkata or Ranaghat or Krishnanagar area. Watch Plassey Battle Field video on YouTube to know what is there & what you will see if visiting Plassey Battle Field, located in Nadia district of West Bengal and known for Historical battle between Nawab Siraj ud Daula & Robert Clive of East India Company.